Landscapes have been difficult this week--grey skies and limestone buildings do not make for great photographs. Unlike summertime, there is about 10 minutes to play with the dusk sky. It had just started to rain when this photograph was made. A straight-up shot of the Seine, with the banks of the Île Saint-Louis visible. We were standing on the Pont Lois-Philippe. After this photograph was made, we headed to Berthillon for ice cream, and then following the natural order of things, we walked 100 feet to Le Caveau de l'Isle for dinner--we had eaten here four years ago. The duck breast, sea bream, and bottle of Bordeaux were excellent. And then it was back to the Marais for an early evening. This was taken immediately before the above photograph, looking straight west. 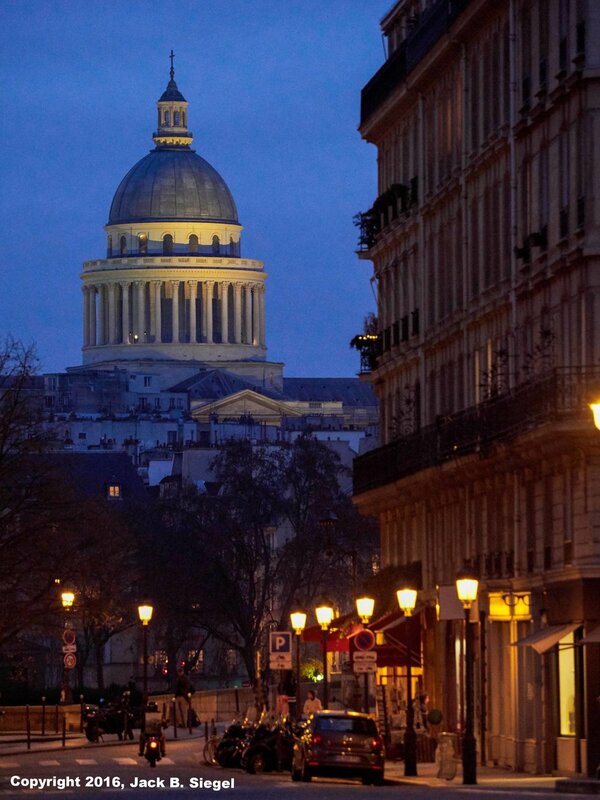 The beautiful domed building is the Pantheon. I made good use of that 10 minutes.